We’re pleased to announce that “Visions of Warriors” will be screening at the University of Maryland School of Social Work on Thursday, 5/3/18 from 5:30 p.m. to 8:45 p.m. According to their site, their mission is to “advance the well-being of populations and communities and to promote social justice.” The school is “ranked in the top 20 schools of social work in the country.” Thank you to Dean Richard Barth, Program Director Seante Hatcher, Rhonda Stewart Jones, and the university for hosting this screening. 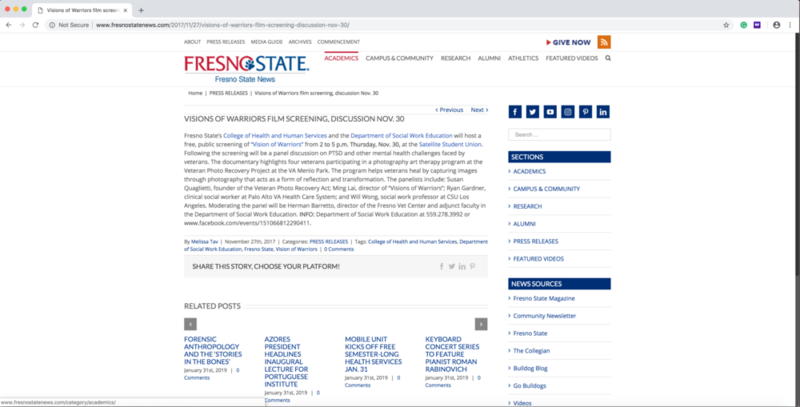 Thursday, 5/3/18, 5:30 p.m. - 8:45 p.m.
“Visions of Warriors” will be screening at the California State University, Fresno on Thursday, 11/30/17, from 2:00 to 5:00 p.m. The screening is sponsored by the College of Health and Human Services / Department of Social Work Education. We’re very excited to share our film with the university and the surrounding community. According to their website, “Nestled in the center of California, in one of the richest agricultural valleys on the planet and one of the most culturally-diverse regions in the country, Fresno State is a place where students grow from high-impact practices.” Thank you to Dr. Martha Vungkhanching, Stephanie Grant, Herman Barretto, and the university for hosting this screening. Thank you to Dr. Will Wong for his thoughtful introduction. Thursday, 11/30/17, 2:00 p.m. - 5:00 p.m.
Download a flyer by the California State University, Fresno about the event. We’re excited to announce another screening of “Visions of Warriors” in Minneapolis, Minnesota. The University of St. Thomas, Minnesota/Area of Emphasis in Military Practice (AEMP) Scholars will be hosting a public screening of our feature documentary. According to their website, “Founded in 1885, the University of St. Thomas is a Catholic university based in the Twin Cities of St. Paul and Minneapolis. The largest private university in Minnesota, St. Thomas offers bachelor’s degrees in over 85 major fields of study and more than 45 graduate degree programs including master’s, education specialist, juris doctor and doctorates.” The University of St. Thomas offers a unique AEMP Scholars program, which brings together military social work students, faculty, and community members that includes courses, course assignments and events specific to military service members, veterans, and their families. Susan Quaglietti, a nurse practitioner and founder of the Veteran Photo Recovery Project, and Ryan Gardner, a clinical social worker who runs the program with her, will be attending the screening and participating in a Q&A afterward. Thank you to Lisa Thomas, the AEMP Scholars, and the university for hosting this great screening and our friend, Dr. Will Wong, for his generous support. Friday, 10/20/17, 5:45 p.m. - 9:00 p.m.
We’re thrilled to announce that the University of Minnesota School of Nursing in Minneapolis, Minnesota will be doing a private screening of “Visions of Warriors.” We’re honored to be able to share our film with their respected nursing program. According to their website, the “School of Nursing is ranked #13 out of more than 200 nursing graduate schools in the U.S. by U.S. News and World Report. Also, “the school celebrated 100 years of leading nursing and health innovation in 2009.” One of the subjects of our feature documentary is Susan Quaglietti, a nurse practitioner and founder of the Veteran Photo Recovery Project. She’s been caring for veterans for more than 25 years. Susan will be attending the screening and participating in a Q&A, along with clinical social worker Ryan Gardner, who runs the program with her. Thank you to Elaine Darst, Clinical Associate Professor and Co-Director BSN Program, School of Nursing, and the university for hosting this great event. Friday, 10/20/17, 9:00 a.m. - 12:00 p.m.
*This is a private screening for the university and not open to the public. We’re excited to announce that “Visions of Warriors” will be screening at Dominican University of California in San Rafael, California. We’re deeply honored to be able to share our film with the university and community. Located in beautiful Marin County near San Francisco, this historic university was founded in 1890. According to their website: “Dominican educates and prepares students to be ethical leaders and socially responsible global citizens who incorporate the Dominican values of study, reflection, community and service into their lives. The University is committed to diversity, sustainability and the integration of the liberal arts, the sciences and professional programs.” Thank you to Dr. Laura Stivers, the Dean of the School of Liberal Arts and Education, and the university for organizing this screening. Tuesday, 9/12/17, 6:00 p.m. — 8:30 p.m.